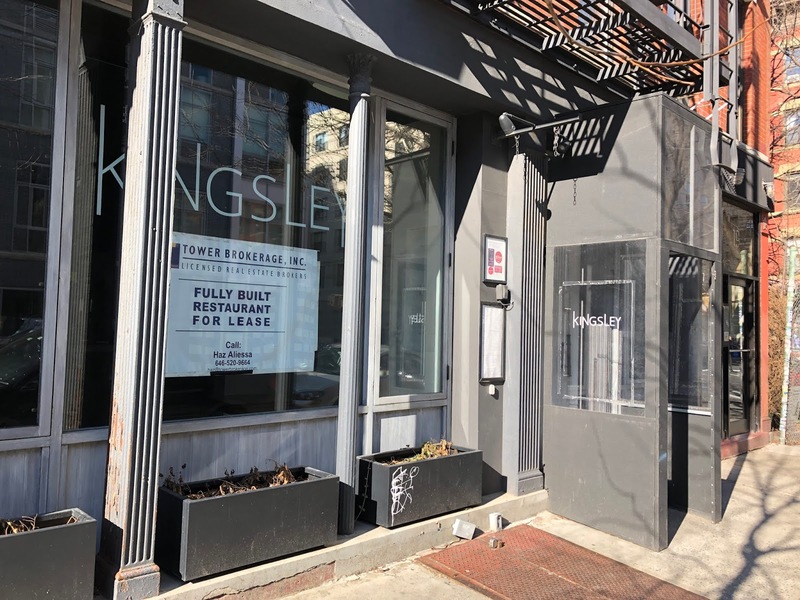 Kingsley went dark back in early September without any notice to patrons — at the restaurant or online — here at 190 Avenue B between 11th Street and 12th Street. 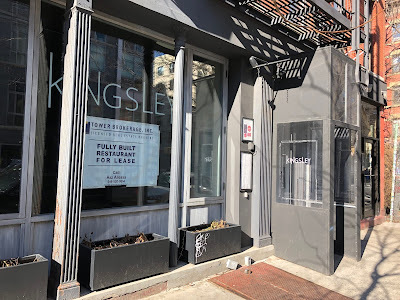 Someone emptied out the restaurant in late December, and the for rent signs arrived this past week, officially closing the book on Kingsley, which served "seasonal, local ingredients with a contemporary French-American menu," per its website. Chef-owner chef Roxanne Spruance opened the space in December 2015, and received some attention given her past work in well-regarded kitchens such as Blue Hill and WD-50. The restaurant took over the space from Back 40, which closed in December 2014 after seven years in business. Chef-owner Peter Hoffman told Eater that "a difficult landscape and lease uncertainty" led to the closure. Not sure if we ever moved past the "difficult landscape." WD-50 opened in a "difficult landscape" but hype (yes I ate there once) and star chef (see him on cable food shows) kept that place full until his landlord pulled the rug out from under him. Ave B is not a magnet for that kind of foodie diner, chef driven spot. I can only assume the rent seemed more doable than space on 1st avenue so it seemed like it was workable to those past restaurants. A successful "destination" restaurant is rare so if anyone is eyeing this spot, think again. Went on some dates here. 1. At first I was really upset Kinglesy were only open weekends. That's NOT what we need around here. I boycotted the place. 2. When they opened full time I went there a few times. Sitting at the bar was a fantastic experience. They had gold plated silverware (goldware?) The big comfy seats were fantastic. The food and experience was amazing. For the first time in my life I had something called an amuse-bouche. I forget what the actual appetizer was, but it was fantastic. I think it could have received at least a Michelin star or mention. Bummer a female-chef owned establishment closed. I was rooting for her.